Widening and carpeting work by the Border Roads Organisation (BRO) on the Manali-Leh highway, one of the highest motorable road in the world, is in progress between Manali to Kulang, even as the entire upper Manali region is still covered with snow. The government is considering setting up an arbitration tribunal, considering the piling up arbitration cases in several departments some of which have been pending for several years. Thousands of villagers of some eight gram panchayats of the Kharsi area of this district demonstrated carrying banners and shouting slogans against the government and the management of JP cement factory here today. Two persons defrauded a resident of Sansarpur Terrace village in Dehra subdivision of this district of cash to tune of Rs 83,000 for sending him to a foreign country for a job and later on backed out. The concluding traditional Rajmadhoroa’s Shobha Yatra of the international Shivratri fair in which Himachal Pradesh Governor Urmila Singh was the chief guest, today culminated with a “depressing political note” in this temple town, as procession took an “overt Congress colour” because not even a single BJP MLA, leave alone a minister from Mandi district participated in the yatra from the Rajmadhorao temple to the Paddal Maidan. 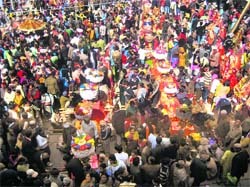 Over 25 artisans who have displayed their traditional handmade agricultural implements, baskets, “kiltas” and other products on roadsides of the Paddal ground in the fair are being fleeced by members of a vendors’ union in connivance with some members of the Mahashivratri mela committee under the nose of the district administration. Many public sector units are running into huge losses and bearing the brunt of this are employees, who are not getting salaries on time. The state agro-industries corporation has not paid salaries to its staff for more than seven months. The state handloom and handicrafts corporation has also not been paying salaries to its employees on time. A four-member team of the Union Ministry of HRD is arriving here tomorrow to select the site for bringing up a central university in Kangra district. The mystery behind sudden disappearance of Raghuvir Singh (27), a resident of Dwal Majra village in Baddi, who had left for Amritsar on February 5, has been solved with the Tarantaran police revealing that he was murdered and his unclaimed body was cremated by the Punjab police on February 6. The three-day annual Holi festival will begin from February 26 at Sujanpur Tihra. Chief Minister Prem Kumar Dhumal will inaugurate the festival and also participate in the shobha yatra. Agriculture specialist Karam Chand Jaswal, who had entered girl’s hostel of YS Parmar Horticulture and Forestry University Research Centre, Jach in Nurpur area of Kangra district on Wednesday last, has been placed under suspension. Former chairman of HP Board of School Education BR Rahi has welcomed the decision of Union HRD Minister Kapil Sibal to start open schools in the state. In a press release Rahi said this step would provide opportunities of education to poor, working and those students who cannot attend schools regularly. The state government has so far disbursed an amount of Rs 1.2 crore as relief to people who have been affected by natural calamities such as rains, floods, fires and road accidents in Chamba sub-division of the district during the current fiscal year. All five accused allegedly involved in the Sillagharat firing incident of February 14 were today produced before the court of Chief Judicial Magistrate Chamba Padam Singh, who remanded them to judicial custody till February 25. The three-day long classical dance, singing and music competition for serious performing arts and kavi samelan started for the first time by the Mahashivratri Mela Committee here ended with a promising note despite lack of proper stage and auditorium for performing arts in the town. The World Bank (WB) Country Director will visit Himachal Pradesh from March 9 to 11 to discuss the second phase of the Mid-Himalayan Watershed Project. Chief Minister PK Dhumal during his recent visit to Costa Rica and Washington met the World Bank authorities and discussed various projects. As a part of their nationwide strike, Anganwadi workers today staged a dharna before the District Administrative Complex today. Keeping in view the increase in traffic during the tourist season in May and June, the BRO is carrying out the work on a war footing on the Manali-Sarchu road leading to Leh under the NHDL specifications. The 222-km Manali-Sarchu road is maintained by the 38 Task Force (GREF). The Manali-Leh road played a key role during the Kargil conflict as food, arms and ammunition for the Indian troops in the border district of Leh-Ladakh were transported through it. The road to Leh finds its way through the 13,050-ft high Rohtang Pass, the gateway to Lahaul-Spiti, Baralacha Pass (4,883 m), Lachlangula Pass (5,065 m) and Tanglangla (5,328 m). The 474-km Manali-Leh highway was included in the BRDB programme during 1964 to be developed as an alternate rout to the Ladakh region. In 1989, the Government of India threw open the highway to foreign tourists, whereas the tribal belt of Spiti and Kinnaur was opened to overseas visitors in 1992. As a preliminary step, initiative has been taken to compile data with regard to the total number of pending cases in various departments, boards and corporations. Principal Secretary (PWD) PC Kapoor has sought details from all secretaries, head of departments, boards and corporations, deputy commissioners, divisional commissioners and other government institutions. Even though it was almost a month back that all departments had been asked to send in the details within 15 days, till date no information has come from even a single agency. As such a reminder was issued to all officials just two days back to send in the details at the earliest. Though many government agencies have pending arbitration cases, it was the departments of Public Works, Irrigation and Public Health, Forest and Himachal Pradesh State Electricity Board (HPSEB), which have the highest number of arbitration cases. Very few departments like the PWD have a designated superintending engineer (SE) Arbitration, considering the large number of such cases in the department. Some of the states like Gujarat and most others in south India have full-fledged arbitration tribunals, which help in not only speedy but also judicious disposal of such cases. The government had sought details of the exact number of arbitration cases, nature of the dispute, how old the case was and what steps had been initiated to resolve the case. “It is only once the entire data of the total number of arbitration cases that the government is engaged in is compiled that a decision will be taken about the setting up of the arbitration tribunal,” said a senior official. He said it was being felt that if arbitration cases were dealt by competent and trained personnel a large number of cases would be resolved through mediation. It was observed that in most cases of arbitration from the government side, the cases had not been handled too well. In large number of cases, especially in departments like PWD, IPH and Forest, where a lot of civil works were undertaken, cases of arbitration by contractors have been pending for several years. It is only once the exact picture is projected that a decision will be taken by the government about the setting up of an arbitration tribunal. Led by president Budhi Singh Thakur and general secretary Daulat Singh Thakur of the JP Cement Factory Oustees and Affected Transport Cooperative Society, Kharsi, villagers staged a dharna outside the office of Deputy Commissioner Nandita Gupta. Rejecting the so-called agreement for distribution of cement-loading work from the cement factory, which gives only 30 per cent to Bilaspur district, they presented a memorandum to the DC. The rally leaders expressed dissatisfaction over the work distribution norms, which they believed were misleading and ignored gram panchayats of the Solan district. They said they were forced to take to the streets when all their efforts to solve this matter through talks with the factory management failed. They warned that if they were not given their justified claim, they would have no alternative except to block all trucks at Kharsi Chowk. Kangra district police chief Dr Atul Fulzele today said Reshipal Singh, a resident of Sansarpur Terrace village, lodged a report with the Dehra police that in January last year Surender Kumar, a resident of Sansarpur Terrace village, took Rs 63,000 from him and Rs 20,000 were taken by Ashok Kumar, a resident of Hoshiarpur (Punjab), with a promise that they would send him to a foreign country for a job. for cheating and defrauding him. SSP said a case under Section 156 subsection 3 of the CrPC was reported at the Sansarpur Terrace police post last evening and today at the Dehra police station, a case was registered under Section 420 and 406 of the IPC and the investigation was started. He said the police parties had been rushed to arrest the accused persons. While the devotees from the distant villages carrying raths of the devis and devtas on their shoulders participated in full spirit in the concluding visarjan and jaleb ceremony today, the state political class stood exposed degrading the tradition, giving it a political colour, rued devlus of the devtas, while talking to The Tribune. The procession behind the devis and devtas was dominated by the Congressmen, who accompanied the Governor throughout her two-day long tour. This amply drove home the point that it is politicians, who are turning these century-long tradition into their own fiefdom, rued the devotees. The today’s jaleb also showed that since the present Governor has been appointed by the Congress-led UPA government, she was accompanied by the Congressmen, while BJP MLAs and local BJP men were conspicuous by their presence. In fact, politics was in full play in the weeklong Shivratri fair. In the inaugural jaleb, the PWD Minister Gulab Singh Thakur was the chief guest and rural development Jai Ram Thakur was special guest and most of BJP MLAs and BJP men participated in full while the Transport Minister Mohinder Singh, who has been sidelined in the Dhumal cabinet, absented himself from the procession. Addressing the gathering at the Paddal Maidan, Urmila Singh urged people to protect the rich cultural heritage. She was overwhelmed by the cultural of devis and devtas that makes Himachal a Devbhumi. She also watched children fancy dress competition and gave away prizes to the winners of the sports meet. According to enquiries made by The Tribune, these poor artisans are paying the same rent for the much less space they occupy on the roadside as other vendors inside the Paddal gram udyog and village industry exhibition hall are paying. As it turns out, these poor village artisans, who are torch-bearers of the otherwise dying village handmade cottage industry, are languishing just because both the government and the mela committee has not done anything for promoting them during the fair. Instead of protecting these poor village artisans, the Mahashivratri mela committee has given a free run to a town-based vendors’ union. These artisans pay rent amount depending on the whims and fancy of members of the vendors’ union. In fact, the Shivratri fair is a time when they make their living by selling handmade implements to villagers coming here for the week-long fair. “We come here every year, but we have lost our traditional space as the committee never helps us,” rued Kishori Lal, blacksmith from Karsog and Bhupraj from Pangna, who have displayed their handmade tools on Paddal Maidan’s roadside. “Last year, the then DC had promised us that the committee will allot them free space, but the union is charging Rs 1,000-2,000,” complained Neelkanth and Mathu Ram, both blacksmiths. Shockingly, the enquiries also found that many stall owners inside the exhibition hall are selling machine-made pillows, quilts, ready-made garments, jeans in front the statue of Mahatma Gandhi set up their and are paying Rs 1,000 per stall. An official at the mela office expressed ignorance about charging of rent from artisans. Even the state electricity board is also facing financial woes, accumulating a loss of Rs 260 crore and running an overdraft of over Rs 750 crore. The board, however, has managed to disburse the staff salaries on time. Latest to join the list of units in bad financial health is the HPMC, whose over 450 officials and employees have not been paid salaries for January. Low procurement of apple has impacted the public sector undertaking financially. Being the state agency for procurement of apple, the corporation has been receiving over Rs 3 crore as handling charges from the government, which is a huge amount in view of the fact that annual establishment charges of the corporation come to around Rs 11 crore. However, a poor crop limited the procurement to less than 950 tonne during the last season as against 45,000 tonne in 2008. The corporation, which procured about 700 tonne out of it, lost an income of about Rs 3 crore on this account. Its accumulated loss has crossed the Rs 46 crore mark and the unsold stock of 450 tonne of apple juice concentrate (AJC) worth over Rs 4 crore is also having a crippling impact on its financial health. The corporation is now trying to find ways for bulk sale of the stock. It is in the process of finalising a deal with the Patanjali Yogpeeth of Baba Ramdev for supplying the AJC at the rate of Rs 70 per kg. It is worth mentioning that at present the corporation is selling a 2 kg pack of AJC in retail for Rs 295, which means that the bulk rate being negotiated will be less than half of it. The bad financial health of the units is causing distress to the employees. They are alleging that government is adopting a dual policy in disbursing the salaries. Sources told The Tribune that the team would be led by joint secretary from the union ministry of HRD Sunil Kumar. The team would visit various sites in the district in the next two days, ie February 20 to 21. This is for the second time the Central Ministry’s team is coming for site selection in Kangra. The first team had come before the last Parliamentary elections. However, amidst strong lobbying by Congress leaders and the state government, the previous committee failed to finalise any sight. The state government wants to bring up the central university at Dehra that falls in the Hamirpur constituency. The government is justifying the move by maintaining that there is no suitable land available in other parts of the district for bringing up the university. The state government has stated that about 500 acres of land is required for setting up the central university and such a huge chunk is available only in the Dehra area. It is also maintaining that Dehra, a backward area of Kangra district, should also get its due in the development process. The Congress leaders are, however, demanding that the central university which was initially announced for Dharamsala should be established here. They are maintaining that since Dharamsala is the central place of Kangra and near to the domestic airport at Gaggal presents a congenial atmosphere for setting up the university. A section of locals is also carrying out agitation for bringing up central university at Dharamsala. Now that the VC of central university has joined the procedure for setting up the varsity, the process is likely to be expedited. It was a newspaper advertisement that led the local police to contact the Taranpur police and the deceased was later identified from his clothes and other belongings. The news had sent shock waves among the locals, as the deceased had booked some passengers for Amritsar in his car (HP-01S-0770) and he had left for Amritsar on the evening of February 5. He had contacted his family members on the same evening at 8 pm and thereafter, there was no communication from his side. The police officials said three bullets had been pumped into his body and it was not clear who had booked the taxi for Amritsar from Baddi. While the police was investigating the case, the sudden revelation had come as a shock to the locals. Enquires from the Punjab police revealed that only Raghuvir’s body was found at the spot and it was now being enquired whether he had dropped the passengers prior to this incident or the passengers, too, had a hand in this gruesome incident. The vehicle was yet to be found. This was not the first such incident in the district earlier, too, a taxi driver from Arki had disappeared in similar manner and later his body was found near Kurali. The rising number of such incidents was now creating fear among taxi operators, who were hesitant to book passengers whose identity was not known. While the Baddi-Barotiwala-Nalagarh area had earned the ignominy of being a safe haven for miscreants several cases of unclaimed bodies remained untraced in the area. In one of the recent cases, the identity of a girl whose body was found dumped near Barotiwala village was yet to be found. Giving this information to mediapersons here today, DC Abhishek Jain said PWD and Revenue Minister Gulab Singh Thakur would be chief guest on the second day of Holi festival, while Education Minister ID Dhiman would be chief guest on the last day and MP Anurag Thakur would be special guest in the function on that day. Jain said the organising committee would give preference to Pahari artistes in cultural nights being organised during the function and “Sa re ga ma pa” fame singer Twinkle and “Amul Star fame singer” Sonu Marwal would be the main attraction of the cultural evening on the first day. Comedian Raj Kumar ‘Rancho’ would also perform on the opening day of function. On the second day of the cultural evening Pahari night would be organised in which Anuj Sharma, Karnail Rana and Dheeraj Sharma etc would present Pahari songs, he said. Playback singer Sarvjeet Cheema would perform on the last day of the cultural programme and several folk singers, dancers and artistes from NZCC Patiala have also been invited, the DC informed. He said every effort would be made to celebrate the Holi function in a traditional and three musical bands have been invited to this festival. In the sports competitions, tug of war for women has been introduced for the first time and cash prizes would also be given to winners and all preparations are in place for the festival, he added. Secretary, agriculture, Ram Subhag Singh has issued suspension orders of Jaswal today. Secretary Agriculture said the Chief Minister has taken serious note of the incident. The accused employee of the university had allegedly entered the girl’s hotel in inebriated state on February 16th. He allegedly misbehaved with the cook of the hostel and later with the associate director. The associate director then called up the police. The accused allegedly admitted to his crime in the police station. The affected families have been provided financial assistance as compensation to them for the destruction caused to their private property, including agricultural land, house collapse etc., besides loss of life and livestock in the area. Giving this information here, Additional Superintendent of Police, Chamba, Devakar Sharma said the accused had been arrested on February 15 in connection with Sillagharat firing incident in which five persons were injured. Earlier, the accused were on the police remand, the ASP informed. These accused will now be produced before the CJM court on February 25 for further proceedings, he added. The World Bank has in principle agreed to sanction Development Policy Loan (DPL) of US $450 million for sustainable environmental growth of the hill state. The assistance will enable the state to carry forward the initiative taken for protection for environment. The union leaders of anganwadi workers alleged that the union government was contemplating to handover social-welfare scheme to corporate sector. The scheme has provided employment to thousands in the rural areas. In case the scheme was handed over, the corporate sector its benefits would be compromised. They also alleged that the anganwadi workers are an exploited lot. They are being paid peanuts by the department. They alleged that the present government had promised to increase the honarium being paid to them to Rs 4,000 per month. However, the promise has not been kept. They also flayed the government’s move to reduce the promotion quota for them to the posts of supervisors from 90 per cent to 50 per cent. The promotion to the post of supervisor was the only avenue for the anganwadi workers. However, the government has squeezed it much to the disenchantment of the workers. The workers also demanded that the rent for building they are using for running the anganwadi centers should also be increased to Rs 750 per month in the urban areas and Rs 200 per month in the rural areas.